My Frame is an iPad application that turns your iPad into a desktop with multiple features to keep you informed and occupied while having your iPad in a stand or frame type position. My Frame is being removed from the App Store due to new policies that disallow iPad app developers to “create their own desktops” within apps. 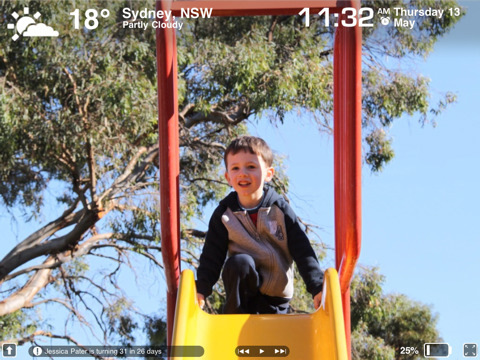 Background Wallpaper – uses built in photos of beautify nature scenery or you can import any photos from your album to play in the “photo frame”. Tap left or right side of the screen to slide manually. Set photos to cycle for however often you like. Notes – A Yellow sticky note to write text messages on for your reference. Only 1 sticky is supported. iPod controls – Load songs and control them using pause/play next/prev buttons. Birthday reminders – in the form of nice message on the bottom. Twitter updates – Login to your Twitter account and read updates from your friends in a little widget. Couple of other good features are the ability to go full screen which turns off all widgets, and the ability to turn on/off any of the widgets on the frame. Another cool feature that we’re seeing a lot of photo frames is voice memo’s which would have been nice to have. Get the app while its still out there. It’s one of those gems that won’t be around long. You can read about the reason why Apple is pulling the app on the Groundhog software blog. AppSafari review of My Frame was written by Joe Seifi on June 1st, 2010 and categorized under App Store, Featured, iPad apps, Photos, Weather. Page viewed 6154 times, 1 so far today. Need help on using these apps? Please read the Help Page.